This article is an examination of the various secondary markings of the A6M2 and A6M3 Zeros made by both Mitsubishi and Nakajima. While these details are of relatively minor importance, it is hoped that this article will serve to expand the scope of the markings that could be found on these aircraft. Unfortunately, as far as the modeler is concerned, many of the markings described below are not available on the various decal sheets currently available. While many of these markings were used on all the Zero that were built up to the end of the war this article limits itself to examine only the markings known to be applied to the greenish-gray painted A6M2s and A6M3s. The changes in the appearance of the serial number data stencil applied to the port rear fuselage of all Zeros will be the topic of a future study. For the historian concerned with trying to identify a specific aircraft note should especially be taken of the sub-assembly data plates described below. The true serial number of an aircraft was only coincidentally the same as the serial numbers found on the numerous data plates scattered throughout a single airplane. A number of preserved Zeros have been assigned incorrect serial numbers due to the misunderstanding of this fact. This article could not have been written without the help of a number of people. Acknowledgment and thanks is hereby extended to Earl Calverley, Jim Long, Jim Lansdale, Katsushi Owaki, Dave Aiken and Dave Pluth. In the manufacturing process a small metal data plate was riveted to each sub-assembly. These plates varied in appearance but generally each carried a serial number that was applicable to that particular component. As each aircraft moved along the assembly line these components were added to the airframe. However, the various components were not necessarily added to an airframe with the same serial number as had been assigned to the different sub-assemblies. This is quite understandable when one considers factors such as varying rates of manufacture between different sections of the plant, the need for remanufacturing substandard parts and the logistical problems of hunting down a particularly numbered part when all components were supposed to be interchangeable anyway. Because of this the serial numbers found on these data plates cannot be used to identify the true serial number of a particular aircraft. Having said that, it should also be pointed out that the serial number on a specific data plate often was very close to the serial number of the parent aircraft as both probably had been made at relatively the same time in the manufacturing process. 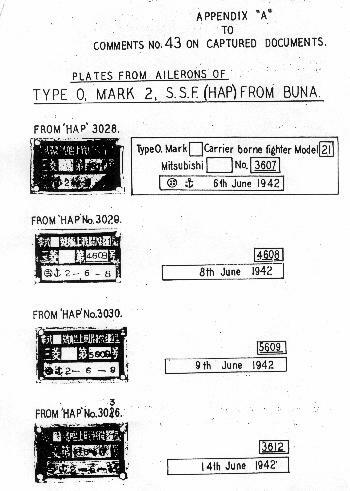 The data plates used by Mitsubishi and Nakajima were different in appearance. Mitsubishi plates were rectangular, usually measuring about 35mm by 75mm. They typically included the Zero type, the part’s serial number, the date and the inspector’s stamp. Nakajima plates were larger, either 50mm by 70mm or 55mm by 70mm. They listed the manufacturer, the Zero type, the aircraft serial number (invariably left blank this line appears to have been deleted in the late fall of 1942), the part number, the part’s weight, the inspector’s stamp, the date (this line was ordered to be left blank as of November 1942 and a number of plates already stamped with a date subsequently had this line mutilated) and the part’s serial number. Subcontractors used plates similar, but not necessarily identical, to the plates used by company they were making parts for. 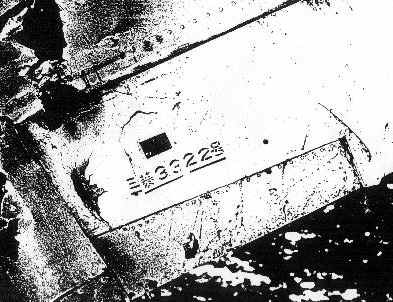 The actual aircraft serial number was the one found in the data block painted onto the port side of the fuselage. As the sub-assembly data plates on each aircraft would invariably have a number of different serial numbers, the painted fuselage serial number was also painted close to most, if not all, of the externally visible data plates. Mitsubishi adopted a pattern with each serial number in one line measuring 32mm by 177mm. In contrast, the serial numbers painted onto Nakajima built Zeros were in two lines, the top one measuring 25mm by 88 mm and the lower line 25mm by 120mm in size. Any removable panel was also painted with the serial number of the parent airplane on the interior of the component. Elevators - In this case the plate was located on the lower side of each elevator just outboard of the second rib. The airplane serial number was to the rear of the plate. 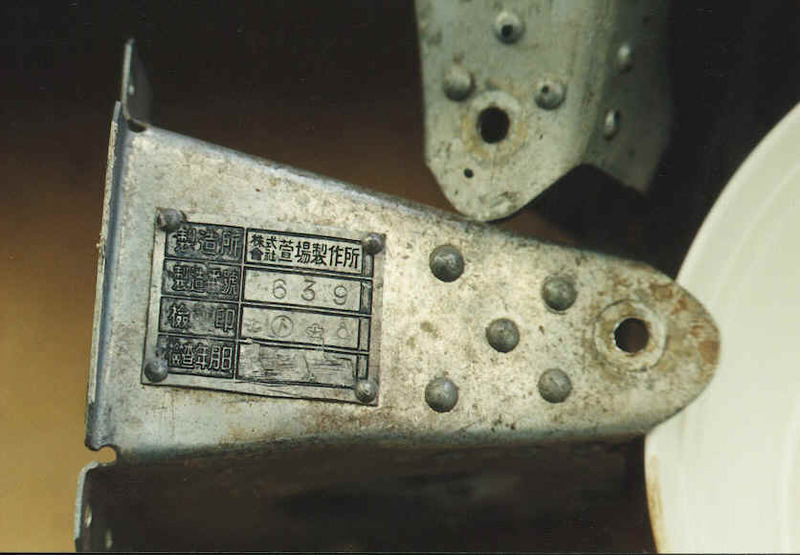 Photo 4: Landing gear cover data plate from the subcontractor Kayaba Seisakujo K. K. The number 639 is probably an uncoded one, meaning that this was the 639th component of its kind produced by the company. The Kayaba company is listed in the United States Strategic Bombing Survey as having been a supplier of landing gear to the Nakajima company. Note that the date in the bottom line has been removed. 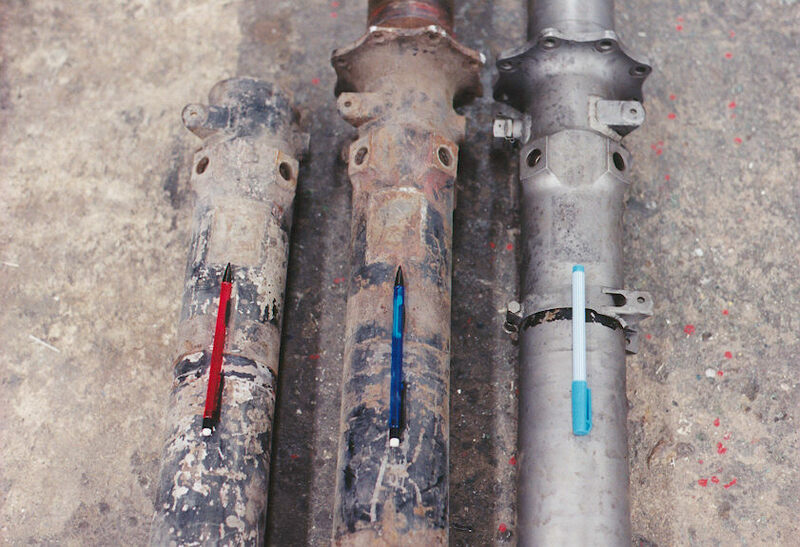 Photo 5: The locations of the landing gear strut data plates are shown by the outlines left when the plates were removed. Flaps - Each flap had a data plate on the interior of the flap skin just inboard of the second flap rib and to the front of the flap’s central stringer. While one photo (Pat Robinson, The Fight for New Guinea, General Douglas MacArthur’s First Offensive, picture of Lt. Col. Edwin Schmidt) has been found that may indicate the location of a painted serial number below the plate the quality of the photo precludes certain identification. Photo 6: The location of the flap data plates are shown by the outlines left when the plate was removed. Drop Tank - Wartime intelligence reports indicate that each tank also had a data plate but the location is unknown but it may have been on the fairing between the tank and fuselage. In all likelihood an aircraft serial number was not painted on the tank but it has been recorded that the last two digits of the airplane tail code were written on the aforementioned fairing. While Nakajima built A6Ms might have had similar markings no evidence to support such a claim has been located. Furthermore, there is a possible explanation of why only Mitsubishi chose to add these markings. Mitsubishi transported all of their Zeros from the factory at Nagoya to the airfield at Kagamigahara on carts with one cart carrying the wings and center section of the fuselage and a second cart moving the rear of the fuselage and the engine. Final assembly was then completed at Kagamigahara. It can be hypothesized that the markings were added to aid in this final assembly process. The Type 21 and 32 Zeros had one tank in each wing and one tank in the front of the fuselage. Most sources indicate that the wing covers on Mitsubishi Zeros were painted red but photos of the Aleutian A6M2 show that the fuselage tank cover was also red. 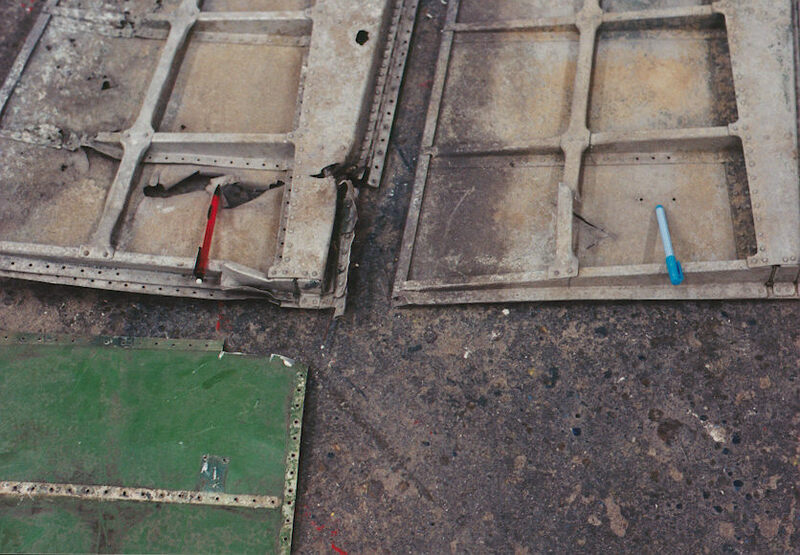 (Model Art 272, p.43) It is very likely the inlet covers of the two additional outboard wing tanks of the model 22 were also red but no photographic evidence of this has been located. While Nakajima built A6Ms very probably also had their fuel tank inlet covers painted red no photographic evidence has yet been found. It should be pointed out that the two round access covers on the upper side of the wing just inboard of the cannon bay covers were not tank inlet covers. These panels were there to allow light into the ammunition bays while the bay was accessed from under the wing. These covers were not red in color. A6M2s built by Nakajima can generally be distinguished by the addition of a white surround to the fuselage hinumaru. However, it should be noted that this feature was only introduced in the summer (July?) of 1942. Thus the first 148+ Nakajima built Zeros are rather less easily differentiated from those built by Mitsubishi. No direct evidence has come to the fore that links the two styles of Hokoku markings to the two manufacturers of the Zero. However, Jim Long argues very convincingly that these markings were applied by the factory and thus can be attributed to either Mitsubishi or Nakajima. He states that the photos of the A6M3s captured at Buna (FAOW 56, pp. 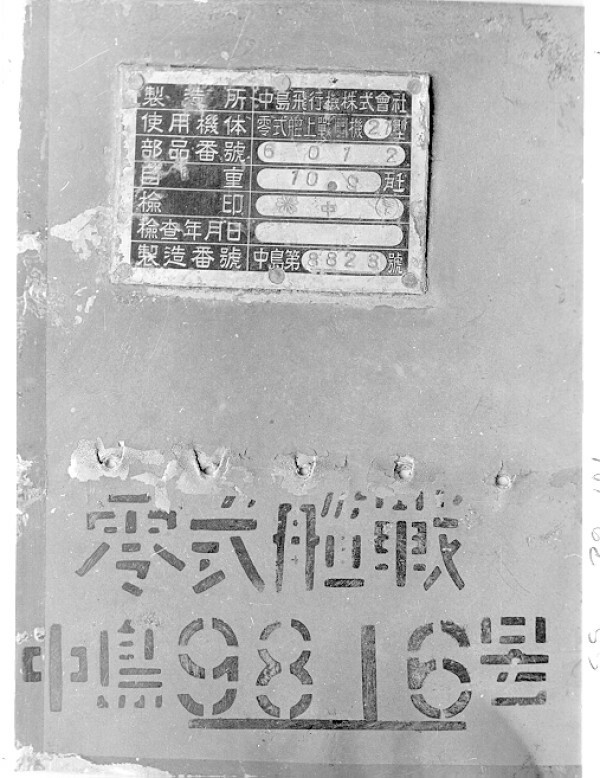 22-24) show that in this case the fuselage serial number data block stencils were applied in a different position from the norm in order to accommodate the rather large and spread-out Hokoku numbers. Long thinks it to be highly unlikely that some depot painters went to the trouble to blot out the old stencil, cut a new stencil, and reapply the identification marking in a new position so that the Hokoku markings could be applied. As it is known that the factory applied the fuselage data stencils it would appear that the factory also applied the presentation markings. Furthermore what better way to shorten the time and effort spent on these presentation markings and events than to have the manufacturer apply these markings at the end of the production process and then carry out a lip-service ceremony to thank the people or organization for the gift. If Long’s assessment is correct then the Hokoku numbers in the style seen on the Buna aircraft can clearly be attributed to Mitsubishi. The other less common pattern (Aero Detail 7, p.44) is therefore that found on Nakajima built Zeros. Both Mitsubishi and Nakajima utilized red Kana “No Step” (No Ru Na) markings on the upper surface trailing edge of the wings of the Zeros they built. Mitsubishi also included the characters for “No Push” (O Su Na) outboard of the “No Step” marking. (Model Art 510, p. 179) Both manufacturers outlined the no step area with red lines, but Mitsubishi (no details are available as to Nakajima's practice) left the outboard side of the rectangle outline unpainted. In contrast the “Step Here” indicator set inside a stenciled oval, which was only found on Mitsubishi A6Ms, was applied in black. The Mitsubishi Zero Handling Manual in the collection of Blayd (a later edition than that reprinted in Model Art 323) stipulates that ailerons with mass balance arms should be stenciled in red with the three characters for “with arm” on the outer end of the upper surface. 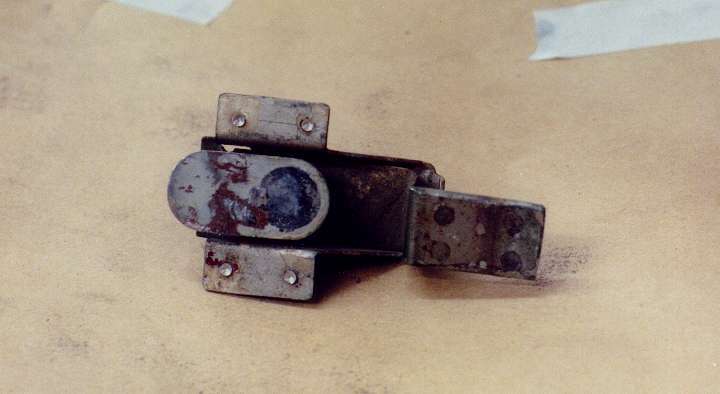 The mass balance arm was fitted, either during production or as a retrofit, to the first 326 Zeros built by Mitsubishi. Ailerons with the heavier internal mass balance weights (starting with Zero number 327) were in turn to be marked in red with the four characters for “increased weight” in a similar location. Presumably these markings applied only to the Type 21 Zero and possibly only to Mitsubishi made airplanes of this type. Photo 8: Japanese characters for “No Step” “No Push” “Increased Weight” (left to right, upper line) “With Arm” (lower line)..